I am the beautiful and elegant Daphne! I am ready to waltz into your home, sit at your vanity, and have both of us gaze into my stunning reflection in the mirror all day. 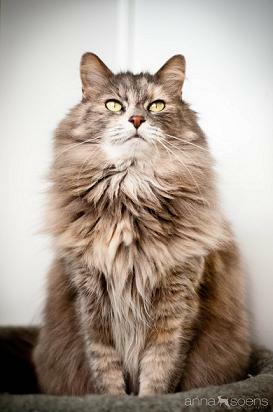 Look at this flowing coat and amazing coloring, other cats start purring just at the sight of it! It’s probably no surprise that people tell me I’m a bit vain, but I like to see it as great self-esteem! It does make me quite confident, I am not afraid to go up to anyone; I just assume everyone must want to touch my glorious fur so of course I let them. In fact I could spend hours and hours on a lucky person’s lap while they pet and groom me. That is just one of my many hobbies. I also love to play chase and explore for treats. At 7 years old I am in the prime of life and have the best qualities of feisty young kittens and mellow older cats. Do I sound like the perfect balance for your life? Come visit me in the Pixie Project cattery! I am fixed, vaccinated and microchipped. My adoption fee is $100.